Five typical locations of the appendix, in order of frequency, are retrocecal-retrocolic, free or fixed; pelvic or descending; subcecal, passing downward and to the right; ileocecal, passing upward and to the left, anterior to the ileum; and ileocecal, posterior to the ileum. Congenital absence of the appendix is too rare to be considered seriously, but an apparent absence may be the result of intussusception. 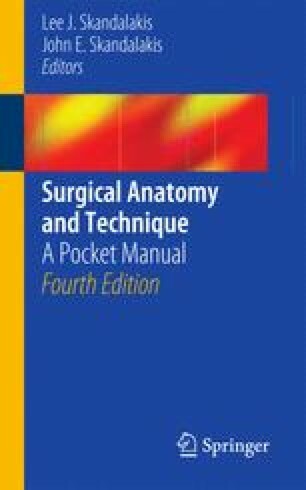 The incision for open appendectomy is usually made over McBurney’s point. To expose a deeply buried retrocecal appendix, it may be necessary to incise the posterior peritoneum lateral to the cecum. During laparoscopic appendectomy, the patient should have an orogastric tube placed to decompress the stomach. Use of a Foley catheter for bladder decompression helps to avert iatrogenic trocar injury to the bladder.